A scan of a color copy of the original computer printout bearing the Wow! signal, taken several years after the signal's 1977 arrival. Just in case any aliens out there in the universe are listening, more than 10,000 Twitter messages, plus videos from celebrities such as comedian Stephen Colbert, have been beamed into space as a big "Hello!" from Earth. The messages are intended as a response to what's called the Wow! 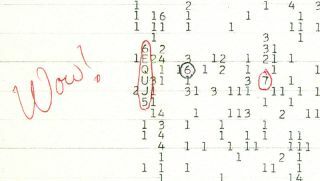 signal, an intriguing radio signal detected on Aug. 15, 1977 that some thought was a call from extraterrestrials. The 72-second transmission was picked up by the Big Ear radio observatory at Ohio State University, coming from the direction of the constellation Sagittarius. Because the radio signal was 30 times more powerful than the average radiation from deep space, a volunteer astronomer named Jerry Ehman who was watching the telescope data scrawled "Wow!" on a computer printout, leading to the signal's moniker. No evidence ever arrived actually linking the transmission to an alien civilization, and no repeat message from the same direction has ever been detected, and the Wow! Signal remains a mystery. Now, exactly 35 years later, whoever sent the emission may be getting a response. "Greetings, intelligent alien life forms. I am Stephen Colbert and I come to you with an important message on behalf of all the peoples of the Earth," the comedian says in his video. "We are not delicious. In fact, we're kind of gamey, and we get stuck in your teeth. It's really embarrassing at a job interview. If you want something good to munch on, go to the nearby Crab nebula. And bring a bib. Seriously, all you can eat." The event was timed to coincide with the premiere of the channel's new series, "Chasing UFOs," which documents and debunks myths about extraterrestrials and UFOs. "For the response, Arecibo scientists have 'gone the extra mile' to increase the chances of intelligent life receiving and decoding the celebrity videos and crowd sourced tweets," according to a National Geographic statement. "In particular, each message will have a repeating-sequence header attached that will let the recipient know that the messages are intentional and from another intelligent life form. Additionally, the transmitter used yields a signal roughly 20 times stronger than that of the most powerful commercial radio transmitter."